My Stem stitches for TAST 2012. This is pretty, it reminds me of Mondriaan! Raphaela, this is nice composition! I love it! Beautiful! Reminds me of Bauhaus designs. What a great way to highlight the stem stitch, Raphaela! Different design and. Beautiful with buttons. 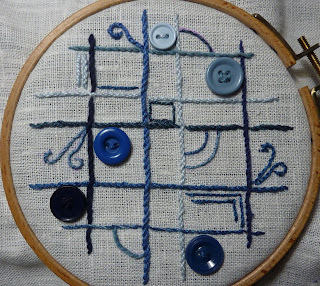 I like your blue variation with this stem stitch! Your design is quite inspiring. Thank you for your kind comment on my stem stitch. A lovely design Raphaela. I love buttons and they look like they really belong in your piece. Very nice.